MIAMI, Fla. — March 27, 2019 — Virgin Voyages, the new lifestyle brand set to disrupt the travel industry, is returning to its Virgin brand roots and creating an incomparable music experience on their first ship, Scarlet Lady. Due to set sail for its inaugural season in 2020, Scarlet Lady will be equipped with an on ship record shop called Voyage Vinyl, The Groupie, a private karaoke and gaming lounge, and perfectly curated music and performances by up-and-coming artists as well as music trendsetters for Virgin Voyages’ Sailors to enjoy. Virgin Voyages’ residency program will feature performances by world-class talent on ship, in-port destinations and at The Beach Club at Bimini. Just last month, Virgin Voyages announced that the Grammy and Oscar-winning DJ, songwriter and record producer, Mark Ronson, has committed to four performances at The Beach Club at Bimini in 2020. Based on Sailor demand, the company has expanded the star-studded residency music lineup to include the multi-platinum chart-topping artist, DJ, producer/ remixer, MK (Marc Kinchen), who has committed to one performance in 2020. The Grammy-nominated electronic music duo Sofi Tukker, known for their smash-hit Best Friend, will also join the Virgin Voyages residency program. With the Virgin brand’s deep-rooted history in music, Virgin Voyages’ sonic identity will come to life aboard Scarlet Lady. Each space on Scarlet Lady will have a unique energy, thoughtfully developed by industry tastemakers and brought to life by up-and-coming talent and special guest performances. The Virgin Voyages sonic identity will have a home in electronic music, but will also incorporate other music genres, ensuring that all Sailors will find a sound they love. The brand defines electronic, as not solely a traditional “EDM” sound, but will incorporate all electronically programmed sounds, even those of more classic eras, and the early innovators of the sound from rare disco tracks, through to 80’s sounds and other important periods of electronic sound. That means timeless classics from varying genres will be artfully blended with new and rising artists. Calming sounds will be incorporated at the appropriate times, to ensure moments of relaxation and rejuvenation are in ample supply. As part of Virgin Voyages’ fierce approach to music, the brand also announced the expansion of their Creative Collective from design, food and entertainment to now include music. Virgin Voyages’ new music Creative Collective will include WhiteLabel Creative, a group of music industry insiders that specialize in sensory branding and cultural programming for hospitality and lifestyle experiences. WhiteLabel Creative is responsible for developing the background sonic palettes across the ship and securing DJs for The Beach Club at Bimini’s residency program. Leaning into Virgin’s history in music, something old is new again with Voyage Vinyl, the record shop aboard Scarlet Lady. Voyage Vinyl will be the go-to spot on board for Sailors to experience music from all eras and genres. Voyage Vinyl features personal listening stations for Sailors to enjoy their favorite albums both current and classic. Sailors looking for something unique can also shop for limited-edition curated albums and special editions of classics. Sailors can also purchase music magazines, headphones and record players. Sailors can let loose at The Groupie, Virgin Voyages’ bookable karaoke, gaming and movie lounge. 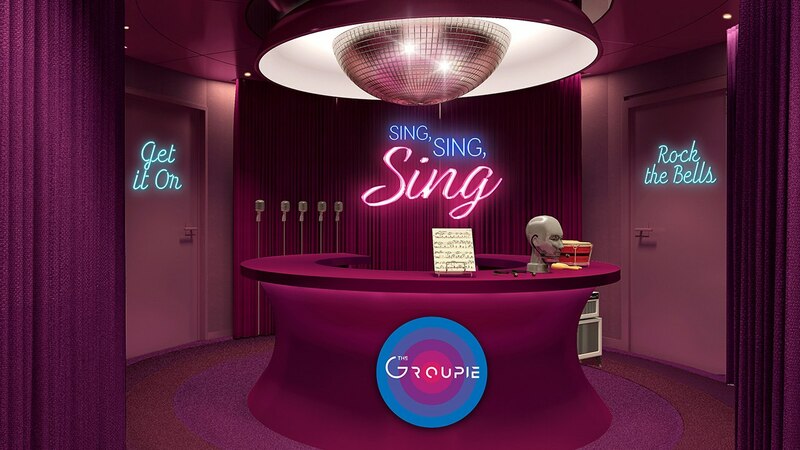 Designed by Roman Coppola, The Groupie was designed as a modernist take on a Japanese-style karaoke room for Sailors to enjoy singing along to their favorite tunes with friends. Virgin Voyages announced its music strategy in a panel discussion at Winter Music Conference and will partake in the local music scene by taking over a part of Gramps, 176 NW 24th St, Miami, in Wynwood for five days from 4-11 pm Tuesday, March 26 - Saturday, March 30. Bargoers will have the opportunity to create their own art as a takeaway item at a vinyl spin art station. Virgin Voyages will also have an epic Instagram moment where visitors can hop on a giant turntable and insta their hearts away in a photo booth. Bargoers will receive a keychain to a special lockbox at Gramps, where they can try their luck to win special Virgin Voyages swag, vinyl record players, vintage records and more.